The space shown above is often a dangerous choice for those with smaller cars. Somehow, drivers of larger cars feel like it's their duty to create a space where there truly is none by pushing smaller cars back a few feet. It happened to us once (see the first paragraph on the linked post). This van decided to try that this morning with the smaller car behind it. However, the close proximity of the larger SUV next in line prevented any movement. 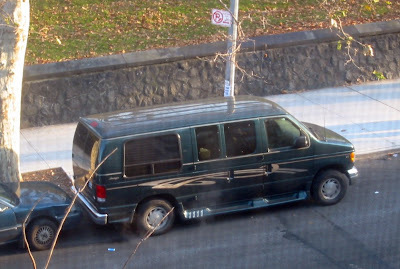 I still don't think it would have been a legal space since the fire hydrant is only a few feet away from the van's bumper, but the traffic cops are pretty lenient with that.